“Thank you so much for your speedy and excellent service! We will recommend y’all to everyone. This letter is to commend your technician, Mr. Collin Crane, who did an absolutely superb job of repairing my garage door (broken spring), and making adjustments and lubricating both of my garage doors all inside of an hour. He exhibited the marks of a true professional whose service was prompt, efficient, thoroughly knowledgeable, and courteous. I could not be more thrilled with how quickly he performed the work, and the very reasonable charge. If I ever need garage door repair in the future (and eventually I very likely will). I’ll come to Texas Overhead Door in Burleson, and hope Mr. Crane is available. No need for me to consider going anywhere else. Keep up the good service. This little guy gave us a review. What an advertiser, don’t you think? Our door was noisy and needed work after it slipped off the tracks once before. We had another company come a few days prior and we felt like they were trying to take advantage of us. They made us feel like we needed to replace almost everything or else it just wouldn’t be right. 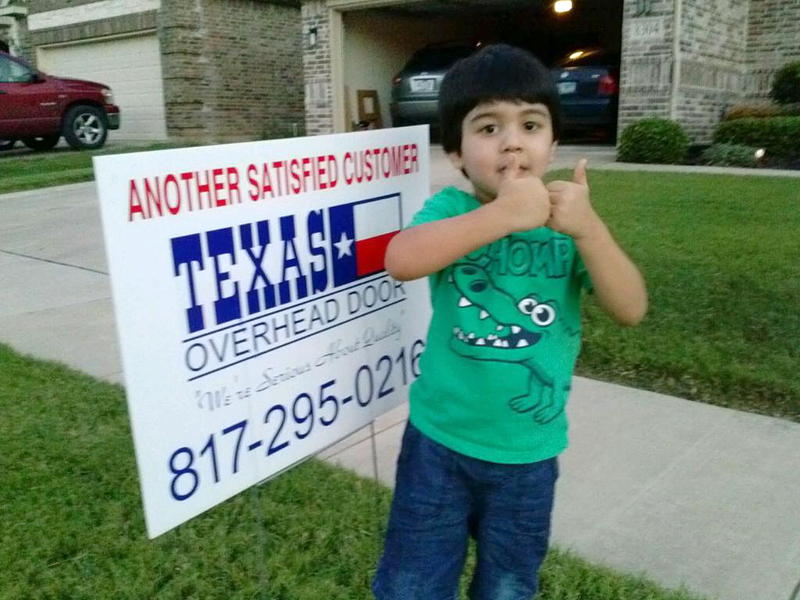 We called Texas Overhead Door and the service man came quickly and was friendly, fast, knowledgeable, and thorough. He found what needed to be replaced and did it quickly. We feel Texas Overhead Door is an honest company that doesn’t want you to spend extra money to replace parts that don’t need to be replaced. This is where many companies make their money. We highly recommend to anyone. Our son is spreading the word as well! It is very uncommon to find a company that still takes pride in their work and goes above and beyond to take care of their customers. Your technician, Collin is a true professional and because of him, Texas Overhead Door has earned all of my future business and referrals. Thanks again! Professional and caring service Overall I have had a pretty positive experience with Texas Overhead Door’s and the service they provided. They came and corrected the door without replacement, and relieved the issue in an efficient and speedy manner. The young man who came out was very knowledgeable, sighted the issue right away and worked to correct it as quickly and professionally as he could. I would recommend this service to anybody else in the area or state looking for garage door replacement or servicing, these guys saved me some hassle and I appreciate the work they have done. He knew what he was doing. Texas Overhead Door came out to service my garage door. It lasted for a while, but then I started to have to same problems. He came out again, brought a new door, and replaced the whole system. He was really good, really fast, and he knew what he was doing. Texas Overhead Door has always been good. They came in the first time and fixed our old garage door and then that broke from the storm so they came in and replaced it. We’ve just been happy with the work they’ve done. They do good work and they do follow ups. They call to see how the door is working. I don’t know any businesses that do that but they did which is great. It was excellent! I had no problems. Texas Overhead Door was great! I had to get my garage door replaced so on a friend’s recommendation I called them and they were able to provide me with an estimate over the phone. The estimate was fine. They actually came out a day early which was perfect because an ice storm arrived the next day. The technician who came out was prompt, did the work properly, cleaned everything up and finished it. It was done completely to my satisfaction. Very satisfied I’m glad I hired Texas Overhead Door. I’ve used them a couple of times to have my old garage door repaired and then I ended up just having them install a new one for me. It runs perfectly! They were very responsive and able to schedule me in very easily. I thought the prices were very fair and I was happy with the service from beginning to end. I’d definitely recommend them. Did what they claimed! I’ve already recommended Texas Overhead Door to others! It was my first time using them. They had sent a value pack of coupons in the mail at my office. I had shopped around and looked at all the experiences and comments from other customers, what their rating was at the Better Business Bureau and comments there. I called around and they were priced right around the same. It seemed okay so I made the decision go with them. When the gentleman came, he knew exactly what was wrong just by looking at it: he opened and closed it a few times and said this is what you need, made suggestions, and it’s been great ever since. He was nice and professional and treated me like I was his best friend. Did what they said they were going to do. I called Texas Overhead Door and told them I had a broken spring. The guy came out that day and knew exactly what I needed. It cost what they said it. This is the company to call! Texas Overhead Door repaired a broken spring on my garage door. They were very professional and responsive. When they came out they had all of the parts that they needed to get the job done that same day. Everything was cleaned up very nicely and they explained everything. I appreciated that they left me some lubrication for the door that was not even a part of the job and do not charge me for it. My garage door is operating perfectly. If you have an issue with your garage door, this is the company to call! I called 3 different garage door service companies to get an estimate on each. The first to arrive was a representative from a “specialist” in the DFW area. His attitude and demeanor was not friendly and e seemed put out just being in my garage. He provided me with an estimate and I told him I wanted to check with a couple of other companies. He stated with a frustrated and rude tone, “Let me call my boss to let him know why I am leaving here empty handed.” THEN… at 7:00pm I received a call from Texas Overhead Door stating David was on his way. David showed up with a smile on this face and was HAPPY to be there at this late hour… in the COLD to help me. He provided the quote, walked me through the repairs and as he did them he told me what I needed to do down the road if I experienced the same problem. He even repaired my door opener controller instead of trying to get me to spend $70 on a new one!!! David was kind, pleasant and finished the job in well under an hour. Thank you Texas Overhead Door and THANK YOU DAVID!! I hope this email gets to his boss. You guys are the BEST and I will NEVER use anyone else on my mom’s garage, my rental property, or primary residence. I plan to tell EVERYONE what an outstanding experience I had. I wanted to thank your company for an excellent customer service experience recently with regard to servicing our garage door. A neighbor referred us to you after our garage door would stop in middle of opening. We had a great experience with your company, even though the issue was not fixed the first time; we were impressed that everyone on your staff was friendly, responsive and committed to getting the job done right. I wanted to thank you all for the professionalism and commitment to service; as this is lacking in most service businesses these days. We will certainly recommend your company in the future. Just wanted to drop a note and let you know the man that came and fixed our garage door today was friendly and professional! Thanks for great service! Sound like a wonderful company and we will definitely call you again. We had a major garage door spring failure on a Friday night, called your company and reached the answering service. A technician contacted us that evening and he explained several options, including coming out that night, after hours, to fix our garage door. He was prompt, professional, courteous and very helpful. We appreciate the quick response to our needs. Consider us customers for a good long while. I expected the typical “bait & switch” where you advertise one price then when the worker shows up you sell something else. However it was quite the opposite, what I did get was an OUTSTANDING technician named Caleb who showed up promptly, with all required equipment, the correct parts and an EXTREMEMLY polite & PROFESSIONAL ATTITUDE. He worked non-stop in the extreme heat of a closed garage, until the job was finished and did a functional check, explained all the details of what he did, and answered ALL questions I had. I would not hesitate to recommend your company to anyone and if I require any additional assistance in the future with my garage door, I will not waste time shopping elsewhere. Thank you very much! Your technicians were very courteous, prompt, efficient and professional in their project to solved my problem. They repaired, lubed and serviced all of the needs of the door. No one can ask for more than that! I thank your technicians for a job well done. Thank you very much. Just a note to say THANK YOU for the pleasant and knowledgeable man who fixed our garage door yesterday. He was so nice and so patient. So happy we called Texas Overhead Door. Thanks again. Today made the third time I have used you since we built our house in 1998. I always keep coming back to you for my garage door needs because your technicians are always honest, they always try to do the best thing for the customer to save the most money, they do quality work. Thank you so much for being an honest, customer friendly company that is hard to find these days. Thanks again. David repaired our garage door after it was caught on the cargo door of our SUV. Another emergency handled with professional efficiency. Thank you & your staff for yet another rescue!